In August Chile is transitioning from its gray and rainy winter to a beautiful spring season. As the trees shyly begin to bloom, it still rains and the sky is still gray; it is cloudy and shiny on the same day. It is cold and warm on the same day. I get the impression that T.S. Elliot could easily have written August is the cruelest month if he had lived here. You never know how the weather is going to be the next day. Yet I was very happy to be back home. After all, I was in Chile to see my family and friends. However, I found myself in a country in revolt. I felt like I was looking into a mirror and finding myself in Egypt, Spain or London, but I was in Chile. I soon realized I was witnessing a major social and political upheaval against the current economic system in Chile. There were major social mobilizations, protests and demonstrations organized by students. Everybody was dancing to the same song: it was time to end an educational system based on profits. This demand was leading them to question the entire economic model — one based on the neoliberal philosophy of free market approach to everything. Perhaps the weather was a song for a country full of contradictions. Chile likes to project an international image of an almost-developed country – whatever that might mean. From the outside Chile is seen as successful economy, an example for other “third world” countries to follow. Chile is a heaven for multinationals seeking to invest in a country where the government doesn’t intervene in their affairs. It doesn’t matter whether they are from mining, forestry, fishery, agriculture or any other industry; multinationals manage the entire Chilean economy to their desire. And because the government has zero involvement, this has major consequences in the country’s social welfare. Chileans live at the mercy of the free market! Thus health care, housing or education have little to no support from the state. From inside, the country is suffering from major contradictions, and its population is tired of living in precarious economic conditions. 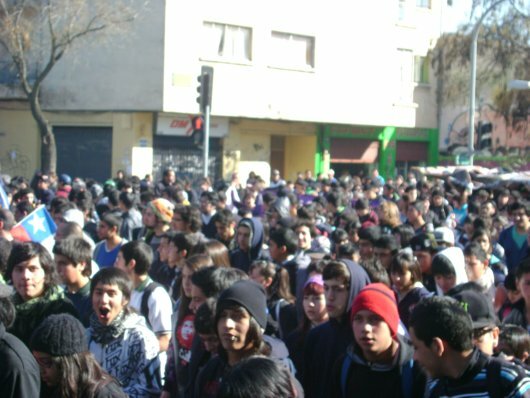 Chilean youth have exposed the weakest link in their free market economy. The one or two generations that didn’t grow up under dictator Augusto Pinochet are realizing how the economic system imposed by the force during the dictatorship is having devastating economic consequences for their own education and future. Chile is the only country in the entire world that has left education up to the market. The current educational system is Pinochet’s legacy. He imposed a system in which schools and universities are driven profits; he ended of the involvement of the state on the education system. Each municipality is charged with running its schools now. This system created educational apartheid among Chileans. Students from poor areas could never attend schools from rich areas anymore. Access to a good education is entirely based on whether a family can afford to pay for that education — an impossible task for the majority of the Chilean families. The student movement emerged in response to a bad education system, but the protestors soon realized that in order change the quality of education, they had to challenge and change the entire economic system. Although it seems like an impossible goal, the students took up that challenge. This meant beginning a critique on past twenty years of democracy, because that’s when Pinochet implemented his economic plan. The student movement emerged as independent from the political parties but with a broad and deep political view for social change. 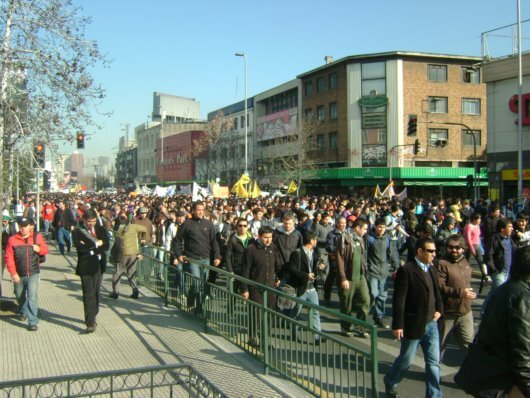 The students have mobilized over hundred thousand students and others in Santiago alone, these mobilizations have taken place in most big cities of Chile as well. The students have also taken over many schools and universities thus paralyzing the education for three months now. Some of them went as far as doing a hunger strike. They are demanding to keep the education system out of the free market system. 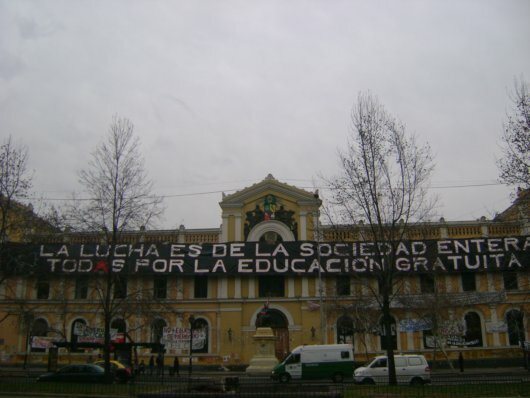 The existing educational system is in the Chilean constitution, also imposed by Pinochet. This is why the student movement has become an important one: they are demanding to change this constitution through a plebiscite. Such a proposal also has implications for many other areas of the Chilean political and economic system. Any change in the Chilean constitution means a change in how the free market controls the lives of millions of Chileans who have no say about anything. It means rethinking how the state should be involved in protecting basic human needs. It also means demystifying Chile as a success model for other Latin American countries, and ending one of the biggest economic and social disparities in the world. Post and photos by Juan Leyton. Hey Juan, this is a great post. It is really exciting to hear that students in Chile are leading the charge to reform the Chilean constitution– it’s clear that this would be an incredible feat that would ripple throughout the whole country. I actually studied abroad in Chile so I have a lot of love for the country and this post hits me with a pang of nostalgia. I was there in 2003, which was not only the start of the Iraq war, but the thirtieth anniversary of the coup. This meant interesting, provocative conversations throughout the year as people probed me to explain my country’s involvement in these two devastating events. It humbled and educated me, and I made many great friendships from the experience. On September 11 of that year, thousands of people gathered in front of La Moneda to mourn the passing of Salvador Allende and to ensure that the world would not forget the other 9/11. It inspires me to know that generations of young Chilean students continue to push government to reverse the constitutional and economic reforms of Pinochet’s legacy. With this and the current Occupy Wall Street protests, it is a great moment for students worldwide. Juan, thank you so much for sharing your insights and reflection. I did not know that Chile boasted the only completely market-based education system in the world. This is almost impossible to imagine, as I benefited from a decent public primary education and a good state university degree. I see how challenging the free-marrket education system would mean ultimately challenging all the free-market policies in Chile. Wow, these students are brave. 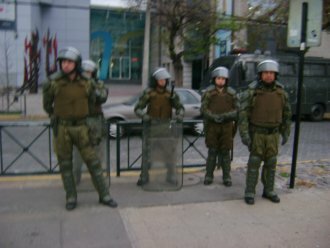 While the Chilean students seem strategic and pointed, the “occupy” demonstrators are regularly criticized for lack of coherency. I don’t think this is a totally fair critique, because in the U.S. we cannot always identify the ONE thing that, if addressed, would overturn the trend of increasing poverty and disillusionment. Where do Americans strategically apply pressure? When groups try to do issue-based protests, the masses don’t join, because there is no one link-issue that connects all the pieces together. Here, we don’t have a Pinochet to blame or a single policy that is the source of our pain. We have Reagan, but it’s just not the same. How do we effectively protest a slow erosion of government regulating the market over time and the slow accumulation of wealth in such few hands? While I haven’t joined the “occupy” movement myself, I am glad that folks are following their hearts and gathering to challenge the reality of living in such an inequitable society… even if they don’t know how to strategically map out a solution. Anyway, Juan, thanks for teaching me something new and for making me think.